The souks of Marrakech are the largest in Morocco and famed throughout the world as one of the most exotic places to shop. The souks are a maze-like network of dim alleyways and small streets, sheltered by straw canopies through which rays of brilliant sunlight radiate off the scintillating treasures below. For the first-time visitor, it can be a bewildering experience. Medicine has played an important role in many North African societies throughout history, and continues to do so today. The traditional equivalent of the doctor in Moroccan medicine is the herbalist – a profession that continues to be practiced in Marrakech, manifested by the herbalist-owned drug stores that line the market districts of the medina, or old town. 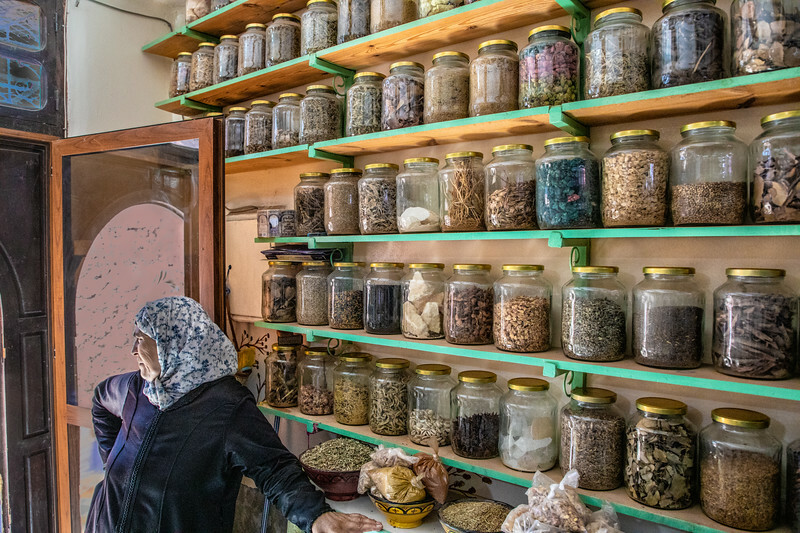 In these shops, Marrakech herbalists stock a variety of plant parts and plant-derived products, sold either separately or in mixtures, which offer cures for every kind of ailment.